A culinary free-for-all isn't the way to gain lean muscle mass. Lucky for you, I'm the 'Skinny-Guy Savior.' Here's a better way. I'm talking to you, hardgainer. I see you there, beating your head against the wall, trying to force your muscles to grow. A bunch of forum posters somewhere led you to believe it was as easy as: lift big, eat big, and get big. Unfortunately, these are old, outdated concepts that, in the long-term, only work for genetic freaks. And you, my friend, are not a freak. Last week I explained why stuffing your face until you're ready to puke isn't the way to build muscle. If you have ever tried this kind of approach yourself, chances are you just ended up looking puffy and bloated, rather than lean and muscular. This week, I'm back with a simple command: Get along with your body! The real key to building a lean, muscular body is to work in alignment with your body's natural growth and recovery systems. When you approach it this way, the results you seek occur much more predictably and sustainably. Let's take a look at five key strategies for adding lean meat to your frame. One of the main problems I see with novice muscle-building enthusiasts is that they get overwhelmed with the entire process of building muscle. They've got their minds so fixated on "after" pictures, they think it will take months or even years before they can see any progress. Because of this all-or-none mentality, they effectively give up before they even start. Even folks who are already working out consistently think they need to do everything as a slow, steady, unending hill: following a set workout for several months, bulking up for several months, cutting for several months. When you take such a long-term view on things, it's easy to lose sight of opportunities for progress in the near future. Muscle growth happens in spurts. It's more like a volcano that erupts occasionally than a slow and steady glacier. Set some short-term deadlines to achieve specific muscle-building goals. Rather than giving yourself six months to simply "bulk up," break it down into a smaller goal of gaining 10 pounds this month. You'll make much faster progress by repeatedly setting and achieving small goals than aiming for one big, long-term goal. If you think gaining 10 pounds of muscular body weight in just one month is impossible, it's not! By strategizing your workouts and manipulating the amount of calories and carbohydrates in your diet, you can do a surprising amount. This is the basis of my 21-Day Mass-Building System. To go along with the previous tip of breaking down your larger muscle-building goals into smaller goals, consider breaking down your larger workout training cycles into smaller training cycles. Whenever you start a new workout program, you can usually make fantastic progress for the first few weeks. After that, the body starts to adjust to the new program and results in a plateau. The body is good at adapting to changes in our environment, so the rapid progress you make when you change your training program is your body growing in response to the changes. There's an old chestnut in the muscle-building community worth taking to heart: Almost everything works, but nothing works forever. You can't stick to the same training program forever and continue making progress. Eventually, your body will catch up and your progress will level off, so you need to provide unique muscle stimulation to keep things moving forward over the long term. When most people first hear about this, they think, Then I'll just keep changing things up all the time! That's the basis for the popular theory of "muscle confusion," which keeps people changing their programs constantly and thinking they'll make progress all the time. However, they neglect one key element: adaptation. 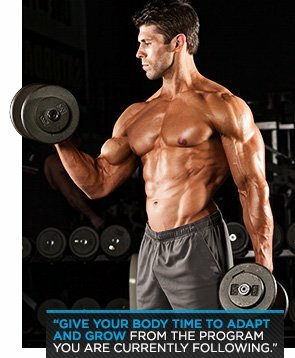 In order for significant muscle growth to occur, you have to give your body time to adapt and grow from the program you are currently following. Only then should you change. Change is good, but don't get haphazard about it. You need to grow within your current training program before you move on to another. For most people, this adaptation process occurs within a three-week time span. After three weeks, progress usually slows down, and they'll be ready both mentally and physically for some new, unique muscle stimulation. Competitive bodybuilders regularly cycle their calories for the purpose of gaining lean muscle mass. They follow an ultra-strict diet before a competition in an effort to lose weight and get ripped-to-the-bone. Then, as soon as the competition is complete, they change their diet and regain the weight they lost, along with several pounds of additional new muscle mass. The end result is that they get bigger and more muscular with every competition they do. The problem with most recreational weightlifters is that they don't pay any particular attention to their nutritional program. Most folks get caught up in the habit of eating the same thing day-in and day-out, but just like your body can adapt to following the same training program, it can also adapt to following the same nutritional program for too long. There have been many research articles published about the concept of calorie-cycling from a fat-loss point of view. After all, we live in an overweight society where the average person wants to lose weight. This same principle also applies in reverse for muscle-building. It just hasn't been documented as much because building muscle isn't nearly as popular as losing fat. But the studies that have been done have a lot to teach us. Forbes et al found in an often-cited study titled "Hormonal Response to Overeating" that when a group of adult female test subjects went from eating a maintenance diet to one that provided 1,200-1,600 surplus calories per day for 21 days, their blood tests showed a progressive increase in the three most powerful anabolic hormones: IGF-1, testosterone, and insulin. This hormone spike was also accompanied by an equal impressive gain in solid muscular body weight. Granted, the ladies did gain a few pounds of body fat along with those lean muscle gains. It was about half fat, half muscle. But can you imagine how much greater those lean muscle gains would have been if the test subjects actually worked out with weights and ate a high-protein muscle-building meal plan? The takeaway is that whenever you drastically increase your calorie intake over base levels, your body will release higher amounts of anabolic hormones to shuttle those extra calories toward lean muscle growth, not simply fat. This elevated anabolic response continues for about two weeks. After that, most people's bodies adapt to the higher calorie intake, and muscular growth progress hits a plateau. This is when you need to temporarily back off your food intake and re-prime your body for another rapid-growth "rebound" phase. This one's short. You can't out-train a bad diet. If you train for fat-loss, eat for fat-loss. When you train for mass, eat for mass; up your calories and healthy carbohydrates like whole grains, vegetables, legumes, and fruits. When you match your workouts with your diet, you get the synergistic effect of both your training and nutrition working for you. It's just as simple as it sounds. 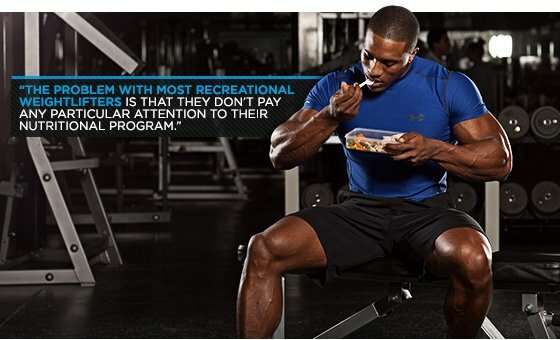 Nobody can eat and train perfectly all the time. There will probably be times when you skip meals, cheat on your diet, and miss workouts. That's just the way it is for everyone, including fitness models. When faced with this inevitability, far too many people fall into the all-or-nothing trap. They say to themselves: "If I can't do it perfectly, then I won't do it at all." Sure, they may be strict and meticulous about their workouts and diet for a few weeks in a row, doing everything spot on and to the letter; but once they mess up a little bit, they get discouraged, quit, and slink back to their old habits. Here's a tip I learned from nutrition expert Dr. John Berardi: When it comes to real world results, there is virtually no difference between following a program 90 percent of the time and following a program 100 percent of the time. If you were stubborn enough stick to a perfect program all day, every day, the stress and sacrifices you'd inflict on your life probably wouldn't be worth the measly extra bit of progress, anyway. Having this 10 percent leeway factored into your program makes it possible to be flexible when life situations arise. When you have that big family barbecue get-together and cheat on your diet, or you have an exam to study for and skip a workout, count those little mishaps as part of your 10 percent. Then just pick things back up for your next meal or workout. I've been bodybuilding for more than 10 years, and I'll be the first to admit that I'm not perfect. I sometimes give in to my junk-food cravings, or I'll miss a scheduled workout from time to time. But because I stick to my plan 90 percent of the time, I'm still able to move in the right direction. My advice: rather than getting freaked out over every little mishap, stay focused on the big picture. 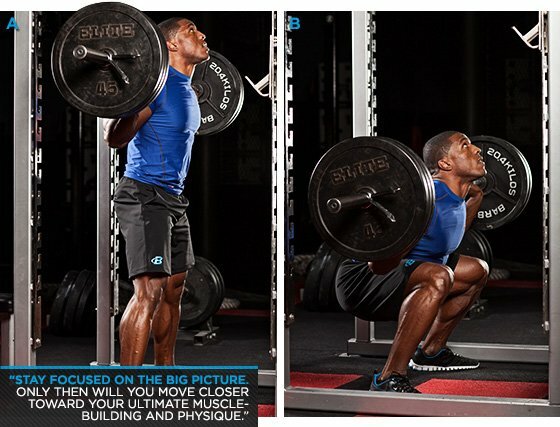 Only then will you move closer toward your ultimate muscle-building and physique transformation goals.